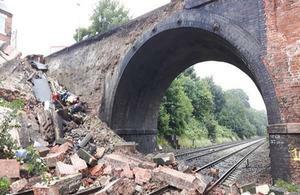 Design shortcomings and a lack of appreciation of the risks of taking cores close to a water main are among factors blamed for last year’s partial collapse of a bridge onto a railway line in Leicestershire, England. The bridge at Barrow upon Soar collapsed on 1 August 2016 while core samples were being taken to investigate subsidence in the footpath (link opens in new tab). The UK’s Rail Accident Investigation Branch (RAIB) has released its report into the incident. The RAIB found that the bridge wall, which was built around 1840, had not been designed to resist overturning. It had also been weakened by a full-height vertical crack. The water main, which ran close to the vertical crack, probably had a slow leak that was causing the ongoing subsidence in the footpath. The investigation concluded that the coring work disturbed the pressurised water main and it ruptured. The consequent release of water behind the wall quickly overloaded it and caused the wall to overturn about its base. Underlying the incident was the lack of understanding of the risk posed to the structure and to the open railway from coring in proximity to the water main, said RAIB. The report makes series of recommendations to both the bridge's owner, Network Rail, and the contractor that was carrying out the coring work.